“Add a bay leaf and let simmer.” – every soup or stew recipe ever. Bay is in all sorts of recipes, but have you ever wondered where it comes from? It comes from the Bay Laurel, (Laurus nobilis), an evergreen shrub from the Mediterranean. Like some other herbs from the Mediterranean, (cough, rosemary), Bay Laurel is only barely hardy enough to withstand the mildest of winters, so people growing it in places with real winter, like Montreal, need to bring their plant indoors during the winter. Look at all those little scale bugs! Scale is a family of small, generally flat, insects that attach themselves to plants and feed on the sap like little tiny vampires. Most types of scale are quite flat, and on woody plants brown-coloured scale is easily mistaken bumps in the plant’s bark. The first time I saw scale it was on a young avocado plant, and I thought that the stem was maturing and getting real bark until one day I ran my hand along it and squished a bunch of the bugs. The wet-looking spots are honeydew. The brown spot is from the sun & wind last summer. Once attached to a plant scale bugs stay put and generate create a waxy coating which makes killing them with any type of spray very difficult. As they age the waxy coating gets stronger. Even worse, scale tends to attach to the stems and undersides of the leaves of plants, and loves hard-to-reach crevices. Many types of scale produce honeydew, a sticky, shiny, excretion, as they eat the plant’s sap, which falls on the leaves, (and table, and everything else), below the insect. For people who aren’t being vigilant, the honeydew is often the first noticeable sign of a scale infection. Scale loves to party indoors. The low humidity, stable temperature, and lack of predators let them breed like crazy and infestations can get out of hand quickly – mine sure has! A few scale bugs are just part of nature, but too many and parts of the plant start to die. squashing a big scale bug with my thumbnail. The easiest way to kill scale insects is with a thumbnail. Any time I’m near my bay tree I take a look and kill a few scale bugs. It’s satisfying and helps keep the population under control without any chemical intervention. It’s also a great way to procrastinate. However, my thumbnail can’t reach everywhere on my bay plant, and I don’t have all day every day to stand around squashing insects, so when things get out of hand, (usually once or twice per winter), I have to mix up some spray and give the bay a soaking. This recipe is simple, relatively safe, and you probably have everything already. 1 tsp dish detergent, insecticidal soap, or a combination of the two. 500 ml / 1 pint hot water. Mix all the ingredients in a spray bottle. Spray all surfaces of the plant(s) you want to treat, paying special attention to the undersides of leaves and crevices. If using dish detergent let the mix dry on the plant, if using insecticidal soap check your instructions and rinse if needed. All the ingredients are approximate. The theory is that the hot water and dish detergent find a way to loosen or wash away the waxy shell that the insects make, and the alcohol kills them. This mix is not 100% effective, but the goal is to reduce the infestation to the point where the plant is healthy, and it can usually do that. If you’re feeling like having fun, once you’ve misted the entire plant, (including underneath leaves), adjust your spray bottle to a stream and blast some scale bugs right off the branches! If the plant is small enough you can try do dunk it in a bucket of soapy water, this way you won’t miss any spots on the plant. I spray my bay plant in the tub to avoid getting soapy, alcohol-y, buggy, water everywhere. After the plant dries out the dead scale bugs will start to dry out too. Some will flake off the plant, some will stay put, and some tough ones will still be alive. If you’ve still got a lot of living bugs, (check by trying to squish them – if guts come out they’re alive! ), you can repeat the treatment after a few days, (I need to do a repeat on my plant). With a little luck we can all keep our bay plants alive throughout the winter so they can go back outside in the springtime. 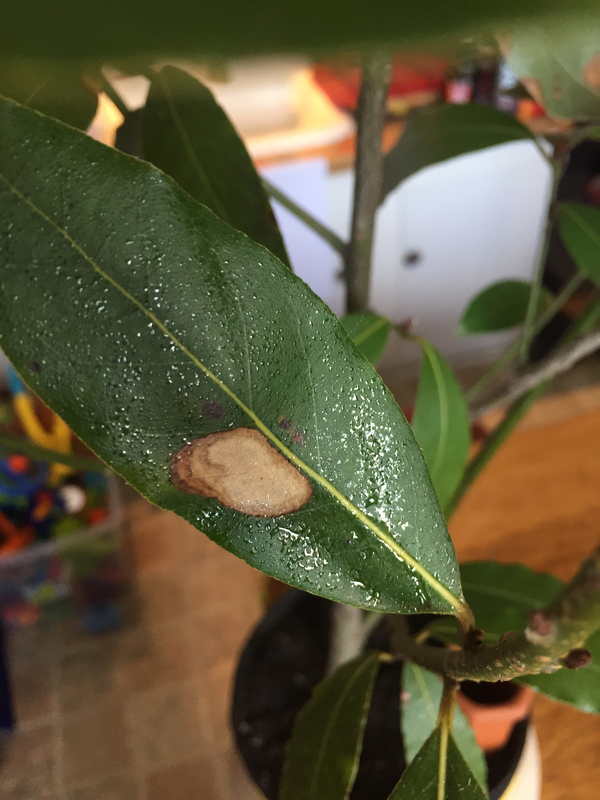 There are still scale bugs on my plant after treatment – it looks like I’ll need a round two!